When asked to comment on the Stolen Generation and destruction of Aboriginal culture in the twentieth century, the general consensus would condemn the actions of the government and missionary involvement with the indigenous community. My findings through an in depth study of John Harris’s We Wish We’d Done More: Ninety Years of the Church Missionary Society and Aboriginal issues in north Australia, provide a contrasting insight of a missionaries experience and understanding of these events in history. John Harris, author, researcher and missionary to Aboriginal people in the Northern Territory recalls the history of the Church Missionary Society in Arnhem Land with an overarching theme that missionaries (particularly at the Roper River Mission, Arnhem Land) had good intentions although in hindsight could have played a greater role providing support to Aboriginal people and by understanding native customs and beliefs have developed a more effective way to share their Christian faith. This notion is in stark contrast to contemporary writers such as Noel Loos who deems the work of missionaries as too invasive, forcing daily regimentation and Christianity upon an unwilling population. The culture and language of a people are an important means of identification with contemporary writer, Jillian E Barnes acknowledging the value of preserving traditional values and customs. Unlike the stereotypical paternal missionary, Harris explains his understanding of the uniqueness of Aboriginal culture, languages and the native way of life. In fact, being aware of the worth of native languages he has devoted many years to studying linguistics, learning Aboriginal languages, translating English work to native languages and within this deepening his relationships with indigenous people. While Barnes believes indigenous culture should be preserved in its’ uniqueness as a tourist attraction with Aboriginals continuing to live in their traditional patterns of life, in seclusion, without the need to assimilate to European culture. Harris on the other hand thought missionaries should learn from Aboriginals about their culture and beliefs and likewise, share European traditions and Christianity in mutually beneficial relationships. In contrast to Barnes desire to maintain a secluded Aboriginal population, Harris opts for greater interaction between Aboriginals and missionaries, and views the lack of prioritizing native languages as one of the greatest failures of CMS, considering from a church perspective this would have allowed missionaries the ability to translate and teach Christian beliefs more effectively. Furthermore, missionaries at Roper River approached communication with the Aboriginal people through a form of Pidgin English yet expected Aboriginal children to learn proper English as taught by their schoolteachers. Harris urges towards the view of contemporary critics when he declares the failings of CMS missionaries in this area who should have spent valuable time learning native languages and better understanding traditional cultural rather than enforcing their own in a paternalistic nature. This is however where Harris flips this agreed point upon its head by declaring that Christianity would have had a greater opportunity to be shared with the indigenous people and flourish in their community if missionaries had not been overwhelmed by busyness and the multitude of native languages but instead developed ways to communicate and translate their beliefs to the native tongue. Harris also writes in conflict to popular understanding and Bringing Them Home, the enquiry into the Stolen Generation. The separation of children from their parents, in particular half-caste Aboriginal children from their Aboriginal mothers has received a response of admission, from the government, church and private organizations, to the long term suffering caused to Aboriginal communities and the European regimentation enforced upon these children. While the Church Missionary Society apologized in 1997 for the burden their actions has caused, Harris claims that children at the Roper River Mission were not separated from their parents, rather given over to missionary care by their willing parents with regular opportunities to visit and be involved in the lives of their children. Harris defends missionaries who were under orders from the government from whom they received money and the permission to create missions, therefore were required to carry out duties they may not have agreed with. To give a balanced argument however Harris urges all readers to view Bringing Them Home and grasp the pain that was caused to this generation of the Aboriginal population. 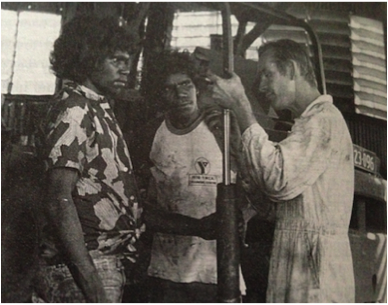 Harris provides insight into the experiences and motivations of missionaries in Arnhem Land, who are popularly considered in a negative light. By writing with a sensitive and well-researched approach, Harris admits the faults of the Church Missionary Society and those in his profession yet provides personal insight into motivations and reasoning of missionaries to humanize these people who are so often demonized for their treatment of Aboriginal people. The 1933 Banking Crisis? ‘We have nothing to fear,’ Roosevelt and the fireside chats are here! During the peak of the Great Depression, the Roosevelt administration used radical economic policy as well as an innovative social policy response in the Fireside Chats that led to the end of the 1933 Banking Crisis. The Chats marked a change in the president-citizen relationship and a new sense of trust that enabled Roosevelt to assuage public fears about the security of the banking system and restore confidence in the economy. Simultaneously, Roosevelt commenced a more intimate style of presidential communication that later presidents would also effectively utilise. Roosevelt’s successful restoration of public confidence, his strong leadership and, in essence, good acting skills allowed him to console the public by presenting an apparent air of confidence and a strong, believable public facade; many historians including Rexford Tugwell, Amos Kiewe, David Ryfe and William Silber agree on this point. The 1933 Banking Crisis was the culmination of months of uncertain economic conditions and financial losses; 342 banks had been closed in 1932 alone. A sort of mass hysteria had seized the American public, who had little financial knowledge and who had been left uninformed by President Hoover of the important role market confidence and investment plays in economic stability. Silber posits that the Banking Holiday of March 5, 1933, which paused all financial trading across America, was the shock policy needed to stop the constant withdrawal of funds from the banking system. During the seven-day closure, roughly 4000 banks were declared insolvent, and under the Emergency Banking Act 1933, only a few banks were declared sound for reopening. Under this Act, these banks would be financially guaranteed by the government. The Fireside Chats were implemented to complement the economic policy through a deliberate attempt to reassure the public of the validity of the government policy and banking security by providing some basic financial education to the mostly economically unaware American people. Tugwell notes that the intimate relationship that the president established with his radio audience through the Fireside Chats encouraged feelings of stability in the public though this was not necessarily the financial reality. However, overall, historians concur that the combined action of the government was highly successful restoring half the withdrawn deposits within two weeks of the banks reopening. Timing played an important role in the success of the Roosevelt administration’s early actions. The public had grown weary of the Hoover administration’s lack of visible, decisive action. 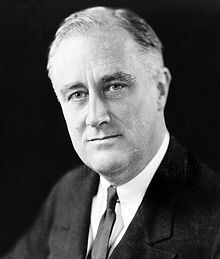 The public were hungry for a change of administration and this only helped to foster the success of the Roosevelt campaign; the emotional state of the public meant that they wanted Roosevelt to succeed; they wanted to believe in the ability of their new president to halt the Banking Crisis. Additionally, Ryfe notes President Hoover’s failure to interact with the public had caused the public to lose confidence in his leadership abilities. Hoover preferred indirect public communication through the press rather than giving live speeches or radio broadcasts, whereas Roosevelt was determined to utilise radio to foster a trusting friendship with the public that would result in his administration receiving greater public support and boosting consumer confidence. Having previously tested the medium of radio during his Governorship of New York, Roosevelt knew that radio had the capacity to establish him as the people’s president by communicating to individual citizens in the comfort of their own homes. Roosevelt evoked what Ryfe calls a ‘friend-next-door’ tone of warmth, intimacy and inclusion that facilitated a new presidential relationship and trust. Roosevelt used phrases such as ‘fellow Americans,’ inclusive language and personal pronouns (‘I,’ ‘we,’ ‘you,’ and ‘our,’) and empathic praise of the people’s response to the Banking Crisis to cement an intimate relationship with the public. The opening lines of Roosevelt’s first, fifteen-minute long Fireside Chat, March 12, 1933, initiated a tone of openness and communication that would shape all future presidential communications: ‘My friends, I want to talk for few minutes with the people of the United States about banking.’ By addressing the public as friends and intimating his desire to aid the public in their situation, Roosevelt immediately established a relationship of trust with his radio audience. This, along with what historians agree was a frank and direct style, allowed him to comfort the frightened public by providing them with a fatherly figure that represented safety, affirmative action and a new hope for the future. Ronald Reagan borrowed Roosevelt’s techniques of directness and reassurance in his television addresses during the Cold War in order to establish an intimate relationship with the public at home and to instil confidence. Reagan’s stylistic mimicry highlights the impact Roosevelt had on changing the way later presidents would approach the American public. President Roosevelt’s Fireside Chats shifted the president-citizen relationship into a new rhetorical paradigm facilitated by direct communication through radio. This newly personalised communication mechanism played a crucial role in the administration’s successful cessation of the Crisis, by fostering a unique public trust in the administration’s abilities and also reformulated the nature of the president-citizen relationship for years to come. Silber, William L. ‘Why did FDR’s Banking Holiday Succeed?’ FRBNY Economic Policy Review (2009): pp. 19-30. http://www.newyorkfed.org/research/epr/09v15n1/0907silb.pdf. F D Roosevelt, ‘Fireside Chat no.1’ in Kiewe, FDR’s First Fireside Chat: Public Confidence and the Banking Crisis. Reed Welsch, ‘Was Reagan Really a Great Communicator? The Influence of Televised Addresses on Public Opinion,’ Presidential Studies Quarterly 33(4) (2003):p 853. When you are sitting on public transport, enjoying your daily commute to work, and you notice an extraordinarily attractive gentleman in a slim cut suit – what are your initial thoughts? Yes. Of course. But ASIDE from that? Exactly. You admire his masculinity. But do you ever wonder why you value these masculine characteristics? Or indeed, why these characteristics are proscribed to be masculine? “The Cult of Identity: The History Wars Regarding National Identity in Australia” (‘Cult’) is an examination of how certain concepts of masculinity came to be embodied in Australia’s national mystique. It explores how historians in the mid twentieth century, desperate for a national history, co-opted poems and bush-ballads of the past to discern a distinctly masculine national identity for Australians. Whilst this essay could not explore the scope of these ramifications, it certainly outlines how these foundations were created. 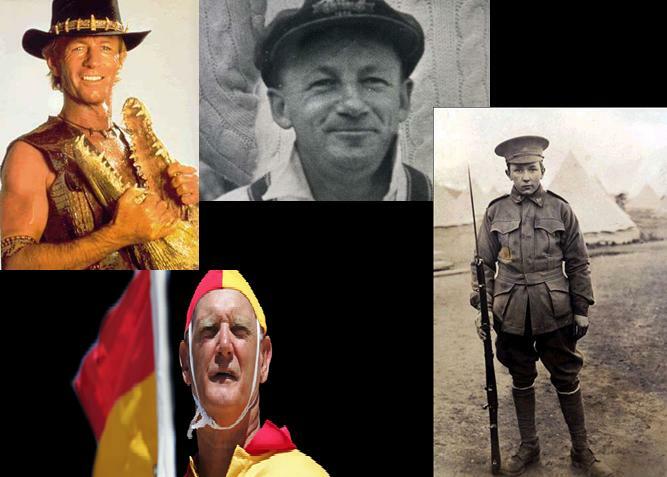 So, before we begin, which of these images do you think truly represents the Australian national identity? Cult seeks to explore the historiography surrounding the representations of masculinity in Australian history. Firstly, it engages with the main secondary source Russel Ward’s ‘The Australian Legend’ (1958) (‘Legend’) and outlines Ward’s thesis. By way of brief summary, Legend posited that Australia’s national identity was founded upon the rural values of nineteenth century bushmen. By exploring the poetry of Henry Lawson and A.B ‘Banjo Paterson’, Ward concluded that rural values of the nineteenth century, such as mateship and collectivist democracy, were ‘adopted by the whole nation… [and] became embalmed in a national myth (Ward, Legend, (1958) p.1). Ward claimed that Lawson and Paterson were the chief propagators in facilitating the idea that bush life was representative of Australia’s national identity. Cult seeks to outline how Ward’s text, which became emblematic as it was the first to consider Australia’s masculine past was soon dispelled by historians. Cult also notes that Legend is now a starting point for all historians discussing Australian masculinity: it has been so constantly delegitimised by historians that now, ‘any discussion of Australian national values seems bound to use Russel Ward as a starting point’ (Rickard, National Character and the ‘Typical Australian’ (1979) p.19). It is important at this point to note that Cult is a historiographical essay: it seeks to evaluate and synthesise the conflicting viewpoints regarding Australian masculinity. Because this was the founding text which encouraged historians to delegitimise Ward. This poem, which had the intention of contrasting the toughness of rural Australia to the relative ease of urban life, shows that nineteenth century artists were attempting to locate and define a national identity for Australians. At what point in time did we begin ascribing certain acts of strength, patriotism and protection to men? Whilst Cult cannot answer these questions, it does highlight how the topic of Australia masculinity has been fluid and often dependant on the the historians’ background and political motivations. By considering how Australia’s masculine national identity was formed and fought over by historians, we can broaden our considerations of how certain characteristics have been delegated to men over time. ‘Those women hidden from history’ : Feminism and the impact it has had upon the historical representations and experience of women in late 20th century Australia. To understand how women rose from the bottom ranks of history, one must understand the theory behind their actions. 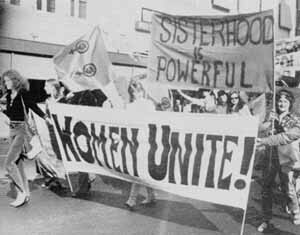 Feminism is a set of ideas; a social and political movement which aims to emancipate women from patriarchy. The diverse nature of feminism has meant that there have been a number of different strands of feminism, also known as ‘schools of thought.’ The three main strands are; Liberal, Marxist and Socialist feminism. Each strand represents a different ideological path feminism can uphold. The theory behind feminism is crucial to understand the actions and motives of feminist revolutionaries, as nothing is done without reason. Historian Marilyn Lake, in Getting Equal. The History of Australian Feminism (1999), claimed that Australian feminism has four historical periods; pre-suffrage feminism (1870’s- 1901) ; maternal feminism (1901- early 1930’s) ; equality feminism (1930’s 1970) and liberation feminism (from 1970). Each period indicates the presence of feminist thought, although it was Liberation feminism from 1970 that sought the resurgence of women within the public domain. Autobiography has long been recognised as an important feminist genre for expanding and realigning the historical and the literary record. The 1970’s saw a strong resurgence of feminist thought, in which women sought to lesson the effects of political, legal, economic, sexual and social oppression. Reflections of the experience of women during the Women’s Liberation Movement in Australia, 1975 has allowed women to tell what has not been told before. Zelda D’ Aprano, was the first Australian women’s movement autobiography and major work of feminist cultural remembrance. Her autobiography titled, The Becoming of a Woman, (1977), explores the suppression women experienced within the workplace because of her class, gender and left wing beliefs. Zelda’s story brought to the stage for the first time, the realities of women’s experience. The recollections of the time suggest that feminism, has provided an opportunity to explore the history of women without the subjugation of patriarchy. For the first time in Australian history the voices of the ordinary woman were being heard and their outbursts of past oppression were presented to the public. Australia and other western nations witnessed the 1970’s, to be the beginning of a vast array of social and political change. Women’s lives, roles and status had began to transform. This was largely due to the growth of feminism and its proliferation into popular thought and debate. Feminism also gained popularity amongst the masses, concerned with a variety of different issues including; sexual freedom, workplace rights and education. Feminism was the birth of a modern world, one of new beginnings for women. 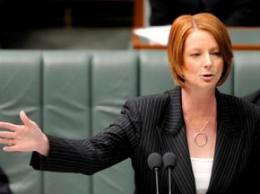 The role of women within Australian women has drastically changed throughout history. The shift from domestic housewife and child bearer to career woman and opportunist is an indication of just how far women have come over the years. Throughout its history it has been feminism that has proved itself to be capable of achieving great social, political and economic change. 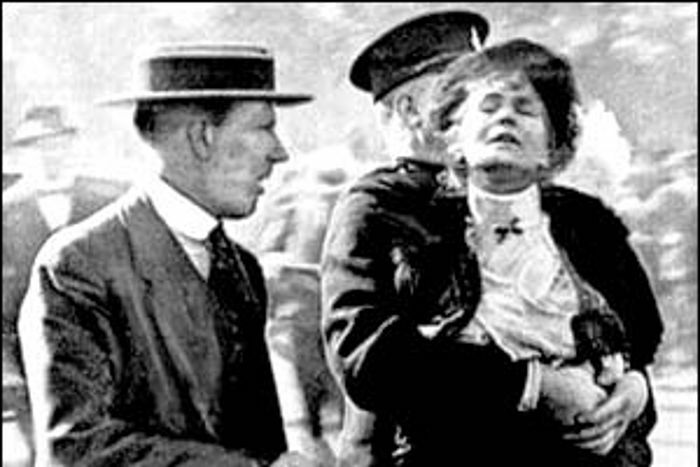 The late twentieth century saw the beliefs and oppression’s held by many women over the year to finally reach a public domain and to be heard. Feminism has influenced women’s history as they are no longer absent, not shut down by the pressures of their male counterparts. “I Had Everything A Woman Was Supposed To Want… And I Was Miserable”- How the Social Expecation to Conform Impacted Upon The Lives of Women in 1950s America. We are lead to believe through various forms of media that the 1950s was a time of vast economic growth, a time of social change and awareness, and a time where women were particularly satisfied returning to their place in the home after the Second world War. Only part of this understanding reigns true. The concept of conformity is arguably a strategic move in an aim to prevent suspicion of being allied with the enemy of the decade; communism. Surrounding women with materialistic “necessities” to improve the home and the emphasis on family life and gender roles within the 1950s quickly showed women their place within society. Although white, middle-class, suburban women of America were presumably happy, they had everything they had ever wanted; the social expectation to conform to gender roles had consequences. The political climate within the post- World War II decade was chaotic. The fear of communism manifested in many aspects of daily life, deeply rooting the concept of conformity with Americans. In the fight against communism, Senator Joe McCarthy allowed for a series of witch hunts against those he considered working with communists. Characteristics such as being a member of a liberation group, being homosexual, having differing political views and simply going against the grain were all considered plausible reasons for communist accusation. With the consequences of such accusations being job loss, being socially ostracized and in some cases, public named, it therefore became increasingly crucial to fit in. The paradigms of what was considered normal began to rapidly shrink. The expected characteristics of women such as beautiful, healthy, with an education that is relevant but does not exceed that of her husbands, were emphasised. There as an expectation to stay home and care for the children and home and that a Woman’s happiness relied primarily on her children, home and husband. There was also an increasing emphasis on what was considered feminine, often making note that women in the workforce was unfeminine. 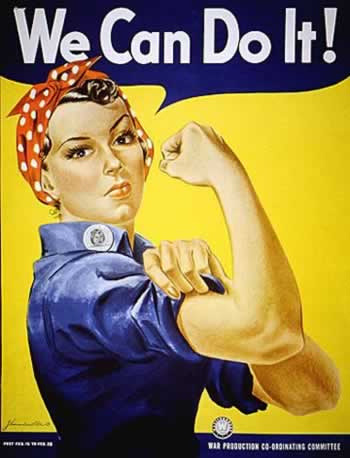 National heroines such as Rosy the Riveter were replaced by pictures of homemakers. Not conforming to such understanding of femininity made way for suspicion of communist activities, which was an accusation many could not socially or monetarily afford. Betty Friedan’s research into the lives of 1905s middle-class, white, women within the United States allowed for a new kind of understanding of American women within the 1950s. Friedan’s research emphasized that women were in fact, incredibly unhappy. Friedan initially refers to this as ‘the problem that has no name’, and tries to intricately analyse every aspect of white, middle-class life, in order to address such a problem. Friedan explains that women are “kept from growing to their full capabilities” and explains that the problem, which she later calls The Feminine Mystique, is more significant than any form of mental health with America at that time. Through copious firsthand accounts, Friedan defines the problem as “feelings of failure and nothingness”, feelings of “is this all”, guilt, and a longing for some unknown absence. Women regularly felt guilty for experiencing such feelings when they were told by society that their happiness relied on the happiness of their children and husband. Magazines such as Good Housekeeping printed articles such as “Why I Quit Work”, playing upon the notion that women with careers should also feel guilty. With the new idea of femininity as the idea of working within the home, women with careers were therefore not conforming to social expectations. Women that were blacklisted by McCarthy, such as Esther Brunauer, Dorothy Kenyon and Mary Jane Keeney all arouse attention through the media through the accusations towards them of communist relations. Newspapers were quick to reveal the job status and accusation of each woman. Making the cases of each of these women public increased the chances of them being both socially ostracized and losing their jobs. It is therefore plausible to assume that not conforming to social expectations aroused suspicion regarding the woman’s place within society, and possibly her involvement with communist associations. In cases such as Esther Brunauer, personal threats were made against her and her family, after the case was made against her in 1951. Job loss, becoming social outcasts, and being labelled a communist was questionably enough to make women conform to social expectations. Film has been a great representation of the way that the memory of the cold war space race has bolstered American national identity. 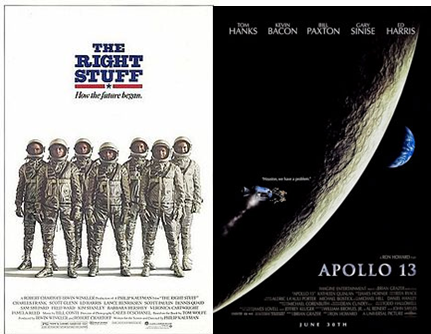 Most films depicting the Cold War space race in serious terms often have very similar motifs and symbolism. Both depict the space race as an enormous collective effort of patriotic Americans. Most will focus on the astronauts as main characters, but will include numerous characters of support roles, to stress the enormous collective effort of the program. Most are uplifting patriotic fare, with strong emphasis on the ‘American-ness’ of the program as a crucial factor for the success of the program. American successes in the space race have often been taken as a yard stick for measuring ideological superiority between itself and the USSR. The Apollo period was the first time where the United States was able to beat the USSR to a space milestone. The USSR was the first to have a satellite into orbit in 1957, and followed with a string of successes that beat the Americans at every turn. The USSR were also the first to place an animal into orbit in 1958, First man in space in 1961, first woman/civilian in space 1963, first space-walk in 1965, first Robot on a celestial body in 1970 and the first space station in 1971. This has led to the Apollo space race taking a pre-eminent position in the minds of most Americans, becoming a huge part of their national identity. This can be found in any other part of my research, from the characterisation of the Russians in most space race films to the way that politicians are able to call upon the space race as a means to garner political support. 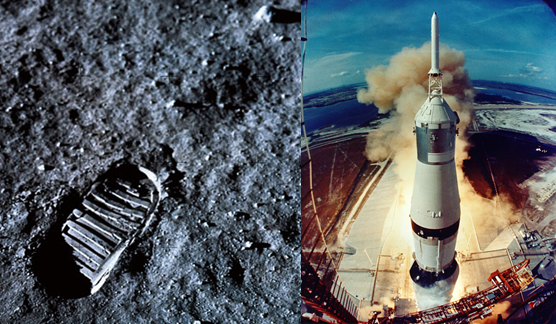 What is also interesting is that the first picture that emerges upon a Google search for ideological superiority is a photograph of a footprint on the lunar surface, the photo on the left, above. This is a great shorthand example of how enmeshed the Apollo space race has become to not only American national identity, but a something larger. With the death of Neil Armstrong in August of this year, the Apollo space race has once again become a prominent feature in the media. Armstrong represented the culmination of the Apollo space program. Armstrong himself has come to represent the Apollo program and the space race in general. He was chosen by NASA officials for his humble personality as well as his skill as a pilot and engineering background. Armstrong was always insistent that his role was always a very small cog in a very large machine. Armstrong withdrew from public life after the Apollo 11 mission, taking a position teaching engineering. These factors, combined with his status as a civilian pilot has led to the memory of the man as the emissary of the entire United States population, a physical representative of the entire population, representing the three main faces of the Space program; the enormous civilian support, the military pilots and equipment, and the enormous engineering processes involved. What is unfortunate is that there is only one photo of Neil Armstrong on the moon, taken by Buzz Aldrin during a panoramic survey sequence. This is the photo on the right, above. Neil Armstrong is visible in the right of the image, working on equipment in the Lunar Lander Module.